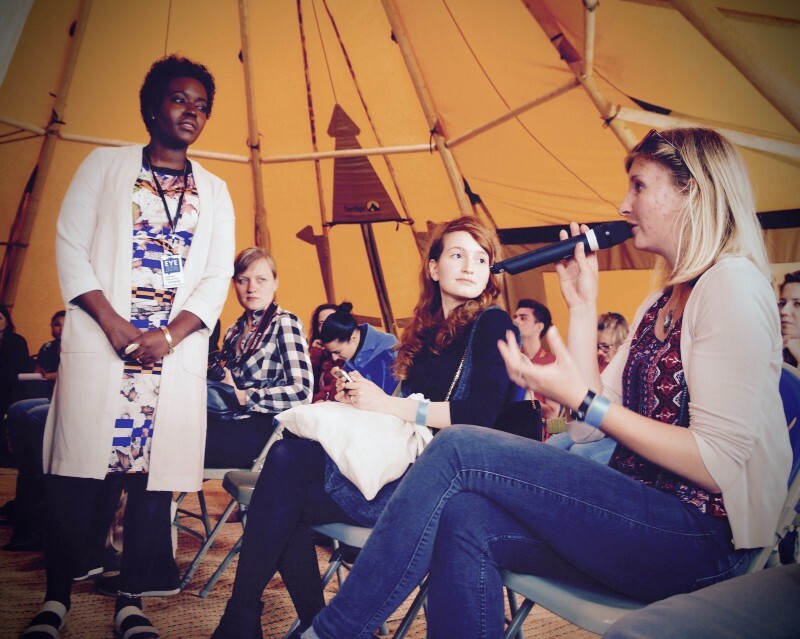 In an unassuming tipi, young participants huddled round the panel of speakers of this year’s “Discrimination Divides, Diversity Connects” EYE event. 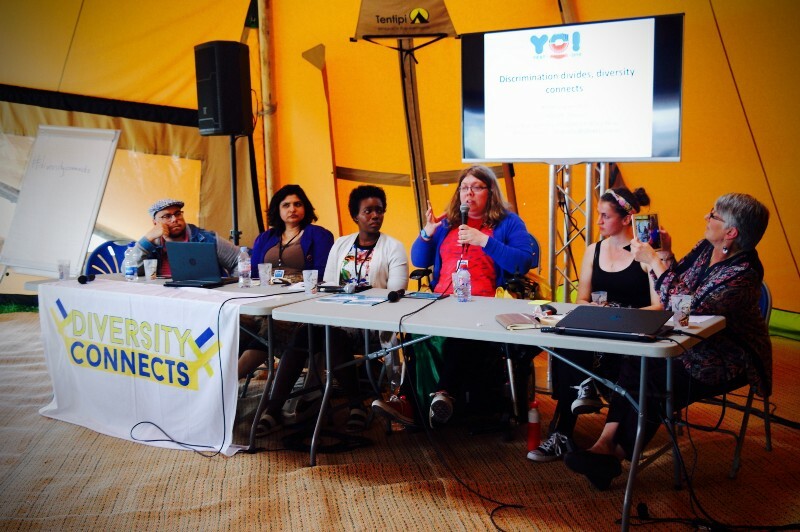 The panel consisted of both activists and politicians, who went on to share their individual stories about diversity, discrimination and non-conformism. Although the panelists’ stories were each distinct in content, it became increasingly evident that there was a common thread that united them: they all pointed to the fact that in today’s increasingly varied society, we now face a new form of diversity, one which blurs the lines of traditional, singular identities. Instead, we as individuals now constitute a multiplicity of identities that fuse together to form, for each one of us, our own distinct and personal brand of identity. This was referred to as, ‘intersectionality’. Kimberlé Crenshaw, critical theorist and legal scholar, first coined the term ‘intersectionality’ to describe how black women often did not fit comfortably in either anti-racist or feminist groups exclusively. The term was also used to illustrate how multiple forms of oppression and discrimination can arise from having intersecting identities. Therefore, although the term originally referred to how race and gender could overlap and intersect to create a distinct form of identity, today ‘intersectionality’ has evolved to include other factors, such as class, nationality, sexual orientation or disability. Urooj Arshad later contributed to this vital point when she stated, “Why should I leave one identity at the door?” as she explained her path. Urooj shared the struggles she faced as a “queer Pakistani-born Muslim woman of colour”, who voiced up against having to choose between her identities. As the discussion went on, it became difficult to ignore the vibrant diversity that existed within the room. As participants contributed with their own experiences, as seen above, it became evident that they too shared the same multiplicity of identities as the panelists. Yet, as this created an atmosphere of increasingly palpable, electric dynamism, it also begged the uncomfortable question — does diversity really connect us, as the title of this discussion suggests? If we each have such complex and distinct identities, how can we possibly create a sense of understanding between one another? One somewhat paradoxical answer to this is that such pronounced diversity can actually deconstruct its own divides. Indeed, mutual understanding can arise between extremely distinct individuals on the basis that they can each relate to having complex identities — regardless of what these identities are. Yet, this relies on the assumption that everyone today has highly intersecting identities. Thus, concretely speaking, what can be done on a policy level to ensure understanding between all individuals among such diversity? Julie Ward, MEP for Northwest England, stressed the importance of dialogue between all communities, a conclusion drawn from her report, “No More ‘Us and Them’: The Intercultural Dialogue Report”. She then went on to comment that, “We need to promote empowerment and dialogue”. Building on this notion of empowerment, one major question remained: where do young people stand as actors in promoting a sense of understanding among such diversity — and such resistance to diversity — in Europe? We followed up with three of the panelists after the event to find out, including Ms. Ulrike Lunacek, Vice President of the European Parliament, Ms. Julie Ward, MEP for the North West of England, and Ms. Urooj Arshad, Associate Director of International Youth Health and Rights at Advocates for Youth. Here below, they each shared their personal recommendations to Europe’s youth on how they can contribute toward building a culture of peace and tolerance in Europe. “Nobody else should define who you are except yourself” — Urooj Arshad, Associate Director of International Youth Health and Rights at Advocates for Youth. “Education matters and intercultural dialogue is part of that” — Julie Ward, Member of the European Parliament for North West England.